On le répétera jamais assez mais pirater un jeu indé c'est comme manger son caca, c'est pas productif ! Question: Pourquoi est ce que les seuls mercenaires que je peux enrôler sont tous des brigands? D'autant que ce système ne pénalise pas le joueur honnête. Par contre ça me fait poser une autre question, le jeu sera t-il dispo en drm-free ? Pour le moment, étant donné que c'est encore de l'early access, ça passe forcément par Steam, mais dans sa release finale, j'imagine pas GoG passer à coté.C'est pour ça que je n'ai toujours pas donné de mon or à Overhype, d'autant que la seule option "full brother support edition" est elle aussi lié à Steam. GoG réveille toi, tu rates je ne sais pas combien de clients potentiel alors que tu persistes à ne pas vendre des early access.Par contre, quand il s'agit de préo, bizarrement, ce n'est pas le même son de cloches. Ouais je peux comprendre. Après pour le cas précis des early access,il y a des trucs qui n'ont plus aucun sesn, que ce soit en terme de durée, de prix etc. Les abus ça arrive quand même. Enfin perso je suis rarement trop chaud pour débourser dans une early access. Pour Battle Brothers, je ne sais plus si j'avais posé la question, mais j'espère bien qu'une version sans drm verra le jour. Après GOG ou pas GOG c'est pas le plus important pour ma part. Finalement si GOG ne prend pas les early access c'est par sécurité évidement. Mais dans ce cas les devs pourraient fournir leur propre version en attendant la release final. Mais dans l'absolu, tu voudrais avoir que des versions devs, ni passer par gog/steam c'est ça ? Eux fournissent une démo jouable, bel effort. Ca permet vraiment de se rendre compte du potentiel du jeu. Et quand versions dev il y a, c'est souvent DRM free. Je pense qu'il y a beaucoup de non dit et d'interdit quand un dev passe par un portail de disribution. A commencer par l'obligation pour les devs greenlighté de donner une certaine exclusivité d'early acces à Steam! je sais aussi que si les dev ne communiquent pas leurs chiffres de ventes et recettes liées à GoG, c'est qu'ils sont soumis à du NDA.Vince l'avait dit je sais plus ou exactement (enfin si, mais pas précisément) qu'ils n'ont pas le droit de donner des chiffres liés à GoG.Et puis, si des trucs comme Steamspy existent, c'est qu'il y a des raisons à cela. C'est pas le top de passer par Steam ou GoG mais il faut reconnaitre que ça donne une grosse visibilité au jeu, donc plus de clients potentiels. Ouais si c'est un projet KS, c'est largement envisageable et c'est tout bon pour nous. Enfin là tout de suite, j'ai rien en tête de ce type. En général, les devs qui foutent leurs jeux sur steam ont sur leur site soit un pack clé steam+version drm-free ou alors rien du tout, juste un lien vers la page steam... ._. J'ai déjà vu ça, c'est... très frustrant si on peut dire. Sinon pour les portails, moi c'est strictement pour pas être emmerdé de drm, le reste c'est que du fric, je n'y apporte pas trop d'importance, mais bon pour des jeunes devs, 20% (par ex) par ci par là ça peut vite faire du moins à gagner, qui se rattrape par une meilleure lisibilité/couverture. Par exemple, là je pense à Serpent In The Staglands, qui était genre en 3ème place des tops vente sur GOG avec la promo de cette semaine. 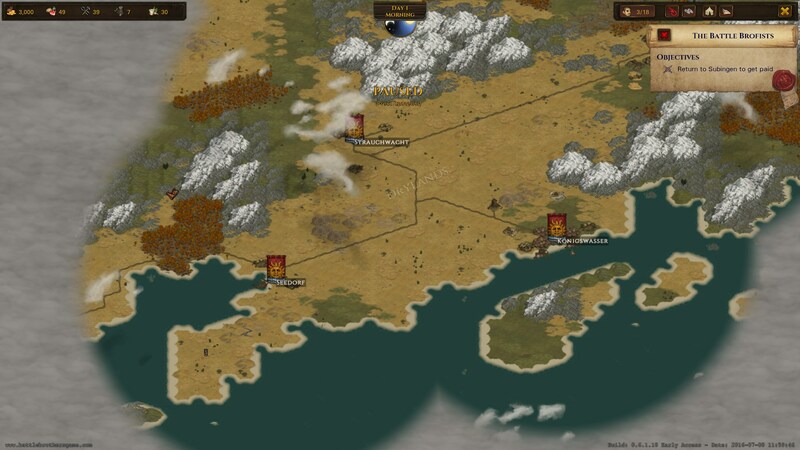 yeah, Worldmap update en video, avec les sons qui vont bien avec les environnement, comme promis. The worldmap update is a rework of the entire strategic part of the game. This means a lot of changes that are all interconnected and can’t really be separately released from one another. The big update containing all of these changes will be released in February 2016. Following this, we’ll go back to smaller updates again with less time in between. 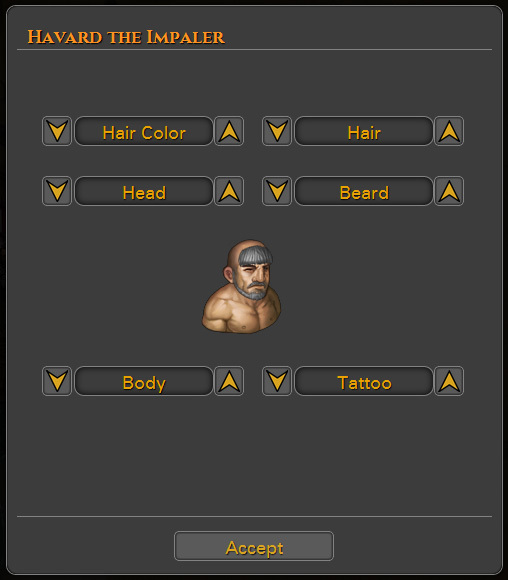 un barbier pour les recoiffer tous, c'est sympa.A moi la "Dread Company"
encore une awesome update.Décidément, c'est une habitude chez overhype. All parties now leave tracks for you to follow that look like footprints on the map. Different factions use their own footprints so that you can see at a glance whether it’s humans, orcs or beasts who moved though. Footprints also scale with the size of the party, so you’ll have a rough idea on how many individuals it is that you’re tracking. Note that we’re still experimenting with the visuals right now, so it may end up looking slightly different in the game. We’re adding the tracking mechanic in order to give you a better idea on what’s happening around the limited radius of vision you have on the worldmap, and to introduce new gameplay opportunities. Even if you lose sight of a party now, you’ll still be able to follow their tracks. You can also potentially follow the tracks of the bandit raiders you just bested back to their camp, and you have more options to both find and avoid parties on the worldmap. Don’t follow large orc or goblin tracks if you aren’t prepared for what lies ahead! Pinaise, ça promet.Et ce n'est pas tout, on nous ouvre les portes des tavernes.Schnapss!!! Patrons can also talk about nearby hidden locations. If you’ve played previous versions of Battle Brothers, you may remember contracts that have you find locations based on vague directions. Those type of contracts aren’t in the game anymore, but that same mechanic is now used for entirely optional locations, potentially full of treasure, you may head out to plunder on your own. The level of directions that individual people can give will differ, so it’s sometimes useful to get directions from several people in order to better pin down where a location might be. You can pay a round for everyone in order to loosen their tongues and have them share more news and rumors with you. 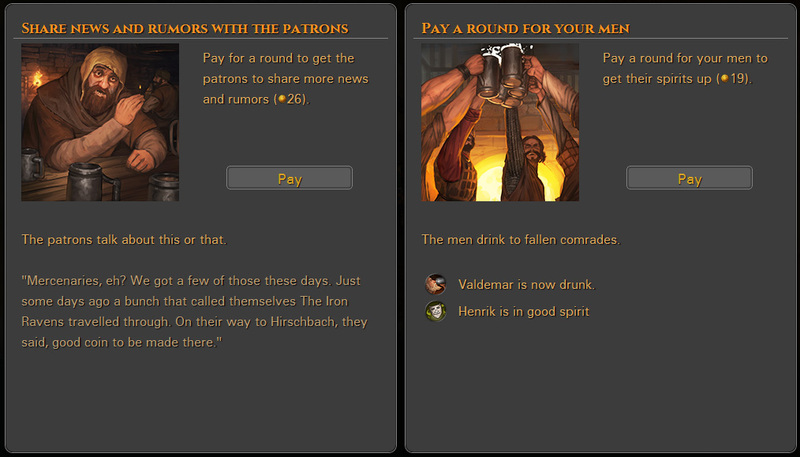 Finally, patrons will also give you flavor responses that tell you more about their situation, the lore of the world and the settlement you’re in, and news about what’s happening in the realm. They may also share light gameplay tips, such as soldiers explaining the advantage of high ground or talking about their experience of fighting goblins and how best to approach it. These types of responses depend heavily on where you are, so you’ll more likely be talking with soldiers at castles, and fishermen at fishing villages. We want the world to feel more lively, more lived in, and this is another step towards that goal. The other service available at taverns is paying a round for your own men. This will generally lift everyone’s spirits and make them forget the horrors of battle for a while, but it comes with its own risk and reward. Every time you pay a round and the men cheer to different things, there’s a chance that the mood of people improves, but also of them getting drunk. Mood is more important now as we attached additional benefits and penalties to it, and it should become more interesting in general as we do a minor rework of how the mood system works in the future. Being drunk, on the other hand, is a new status effect quite detrimental to combat effectiveness, although it does make people more brave. It doesn’t persist for long, but is succeeded by a hangover, which is a more mild debuff. Whether people get drunk or not heavily depends on their traits. For example, strong and tough characters don’t get drunk easily, whereas tiny and fragile characters do. All this then comes down to the decision of how many rounds you want to spend for your men in order to increase the mood of the company vs. the increasing risk of them getting drunk and being severely handicapped the following day. Old savegames won’t be compatible with the new version, unfortunately. tuto, screen d'intro, plus de musique, et sur le recrutement d'autres mercenaires. Finally, the big worldmap update has arrived! 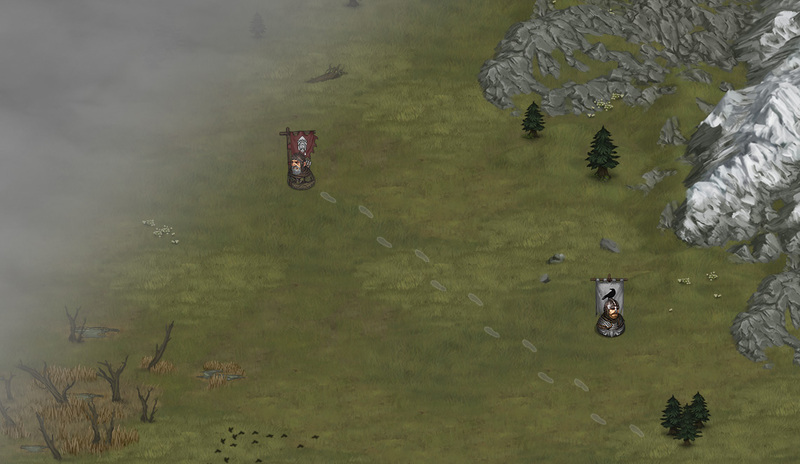 Battle Brothers has made a huge step towards completion and to how the finished game will play. Below you’ll find a list of all the major changes and additions to the game. And we’re not done yet! Once the dust from the update has settled, we’ll return to smaller and more regular updates again so that you’re likely to find something new in the game every week. There are several more features (yes, including formations!) and loads of more content we’ll be adding until the game leaves Early Access later this year. As a very small team we depend on your feedback to make this game as good as possible. Please leave us your thoughts and feedback on balancing, progression and gameplay in the forums! With so many changes, introducing new issues is also pretty much inevitable. If you encounter any bugs, problems or crashes, please let us know in the forum following the instructions there. A bigger and all-new procedurally generated worldmap comes with new terrain, oceans and shores, and wild and unexplored parts covered in fog. 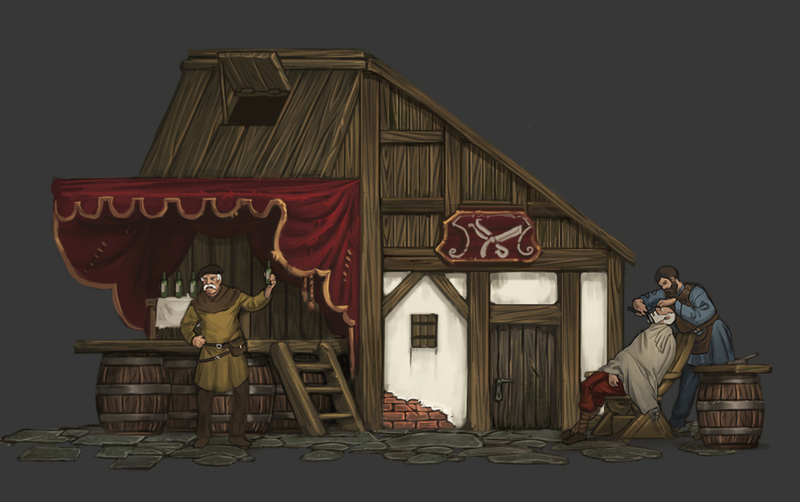 It’s teeming with life as peasants, caravans, ships, hunters, beasts and many more pursue their goals. Settlements differ vastly in appearance, size, services they offer, men to hire and goods to buy. Fish is cheapest at fishing villages, more metal-based products can be found at mining settlements and you’ll find men with combat experience at castles. Contracts are completely redone. You can now negotiate the terms of payment, and every contract comes with twists to spice things up and keep you on your toes. There’s 9 contracts in the game right now, double the amount of before, and we aim to have several times that for the finished game. Noble houses vie for power and cities are ruled by corrupt councils. Meet the leaders of factions on and off the battlefield, make powerful allies or betray them and feel their wrath. All this in contracts we’ll be adding over the coming months now that the system is in place. All parties travelling the world now leave tracks for you to follow or avoid. Different factions use their own footprints so that you can see at a glance whether it’s humans, orcs or beasts who moved though. Make camp to have your men recover from their wounds, repair their equipment and have time pass faster. But be careful, the camp fire will be seen from afar and may attract unwanted attention. The game now comes with a proper introduction and story to set up the mood and ease you into the open world gameplay with useful advice from other characters. Five new music tracks join the already hour-long orchestral soundtrack. Orcs got all of their sounds redone, and the game now has a rich ambient soundscape, from birds, to the wind howling, to people in the streets as you visit one of the many cities of the world. méa culpa, j'ai craqué, j'en peux plus d'attendre ce bijou, je veux y jouer RIGHT NOW!!!!!!! Sorry Overhype, j'aurais tant aimé que pour ma transaction on s'abstienne d'intermédiaire, mais pour une version supérieure, c'était la seule solution possible. Longtime j'avais pas parler des MAJ, on a donc eu une refonte de certaines mécaniques (entre autre un roster pour les compagnons qu'on embarque pas dans une expédition, ou des systèmes de blessures)de l'UI qui est maintenant super chouette, des graphisme re-amélioré que ce soit pour les personnages ou des éléments de carte. We’ve entered full production now on the excitingly gruesome new injury mechanics and will be revealing them to you next week in a detailed blog post. For now, we give the word to our talented musicians to listen to and hear their thoughts on the most recent additions to the soundtrack of Battle Brothers. Hi everybody, Patrick from Breakdown Epiphanies here. Over the course of the last weeks we added some new tracks to the Battle Brothers soundtrack, a few of which we would like to showcase in this week’s devblog. So without further ado we’ll start with the latest piece in our musical arsenal, the third theme for battles against the notorious orcs that are haunting every late-game mercenary company’s dreams. We’ve started naming the tracks for the soundtrack inspired by names and places from the game now, so instead of the rather bland “Battle Track III”, we give you “The Might of Obrokk”. At the start, our goal was to have two fairly long and varied themes for battles with each faction in the game. This third Orc track we did mostly for fun, although you can say that the Orcs pose a prevalent threat in the late game so more music that carries the weight of fighting these armored behemoths will be a welcome addition. We’ve been listening to Howard Shore’s beautiful and brilliant soundtrack to the LOTR-movies a lot lately and we always loved Shore’s take on Tolkien’s world. So we had to have a go at an orchestration in his style while trying out some awesome new instruments we got our hands on. Like with all of the Orc music for Battle Brothers, we’re relying mostly on brass in our arrangement, accompanied by odd rhythm patterns that feature somber and tuned percussion, as well as hammering on all kinds of metal surfaces. All of this culminates in a more harmonic but still menacing ending with a big choir build-up. If at that point Obrokk has not wiped the floor with your puny mercenaries, and somehow you managed to survive, feel free to loot some juicy man-splitters off of those greenskin corpses, as the approaching reinforcements sound their war horns in the distance. A few weeks earlier the guys from Overhype asked us for another track that could be played when travelling on the world map. Although we already wrote a bunch of music for this part of the game, some more variety was needed, given how much time players spend getting from town to town and looking for work for their company. Overhype have a lot of stuff planned that will incentivise exploring even further to make this part of gameplay stronger for the final release, so providing more music for the world map is also setting up for these improvements. “Traversing the Northern Clanlands” starts out with a very mellow and soothing string arrangement that won’t get in the way when quickly hopping on to the world map screen and e.g. back to a city. After the first part though it transitions to a wide and epic theme that evokes (so we hope) a feeling of wandering and exploration (I’d say riding across the countryside but you all know that we are not very keen on horses around here ^^). Lastly we would like to present a piece that has been in the game for quite some time now but that many of you might not have encountered up until now because battling the forces of the various noble houses still needs a rather complicated setup at the moment. This will change when faction warfare becomes a thing, but until then, feel free to have a listen to the first Noble Houses Battle Track here. All of the tracks related to the human faction in the game (bandit themes, town- and stronghold themes) feature acoustic guitars in some way and so does the music for battling the noble houses. Other than that, given the tone of Battle Brothers we could not help ourselves but think about Ramin Djawadi’s main theme for GOT and came up with a waltz in 6/8 (much like our “Stronghold Theme”) that uses a similar call-and-answer structure between a solo cello and the rest of the string section. Later, there are more strings, lots of brass and choir. We basically pulled out all the stops on this one, and its project in our audio workstation is a good contester for “most-notes-played per minute” in the soundtrack. So what’s on the horizon? Next up is a second track for the beast faction that is already in the works. It will feature almost exclusively drums and percussion (those direwolves still having problems to play melody instruments with their clumsy paws) and will be a bit more up-tempo and dramatic than the first theme that was more about setting a dark and threatening atmosphere. After that we’ll tackle the second noble houses theme so we’ll have that ready for when faction warfare is being introduced. There might be some more new content that will need some musical accompaniment until the final release (like locations or events). si c'est pas La Classe cet écran!! Coucou ! Si j'ai compris, grosse part de procédurale à la création de partie, donc le contenu "histoire" serait plus maigre que pour un rpg plus classique, non ? Enfin, la seule vraie question de mon charabia, c'est est-ce que ça représente une charge de travail conséquente une trad Fr ? Parce que là tout de suite moi ça me donne envie. il vaut peut être mieux les laisser sortir le jeu d'abord, mais avec les mômes qui grandissent, y'a comme une envie qui se dessine. De plus, je pense qu'il vaut mieux attendre qu'il sorte de son early access. Final Update released to Beta Branch! Here we go – the new and final major update is now live on the beta branch of Battle Brothers! As this is the final major update, our focus was on general polish, balance and quality of life improvements as much as on the remaining major features. Here’s the shortlist. Three different ‘Greater Evil’ late game crises for you to get involved in – a war between noble houses, a greenskin invasion and an undead invasion. Each comes with their own set of contracts, events and changes to the world. The Ancient Dead – an entire faction with new enemies to fight, new lootable weapons and armor, and unique tactics on the battlefield. A new system for mood and desertion – your men will react to how things are progressing, and it’s your job to keep them content. Ambitions – set goals for your company to pursue on their way to become legendary. Obituary – honor the brave men that have fallen under your command. Retirement – retire from your mercenary company when you’re ready to start a new life, and see how the company and its members fare without you. A complete overhaul of Ghouls into the new and more challenging Nachzehrer. New mechanics for morale to make resolve and initiative more important. Lots and lots of smaller improvements, changes and additions. Steam Trading Cards will be unlocked at a later time. While this beta version is very close to the final release, there’s still things yet to come over the next few weeks. 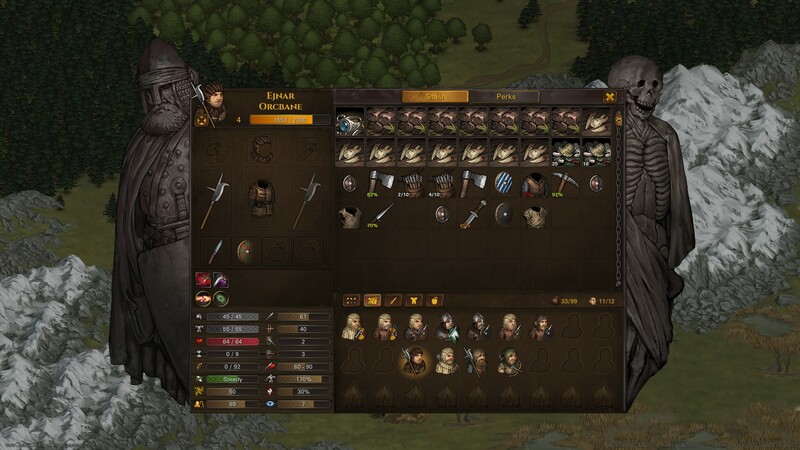 Any saves created with the beta version will be compatible with the release version, but some additions or late changes may require a new campaign in order to take effect. If that’s a problem for you, don’t opt into the beta. This update makes changes to many of the game’s core mechanics. Extensive changes like these will inevitably upset the game’s balance and introduce new issues. Participating in the beta is optional for everyone that wants to experience the new content now and doesn’t mind a few hiccups – we’re thankful for your feedback and bug reports! Everyone else may want to wait a few weeks until the game is more balanced and any issues that popped up have been ironed out. Please report any issues you encounter in the forums following the instructions there. Do not leave random complaints as comments to this news post, they’d only get buried and lost. The final release is not more than a month away. Stay strong! C'est la fin dos Gaiteiros. La vaillante troupe, après avoir occis à grand mal, une troupe d'orcs, fut lâchement prise en embuscade par quelques gorilloïdes. Ayant conscience de la fin à venir, ils décidèrent de périr l'épée à la main; rendant ainsi hommage aux femmes galiciennes, qui, en lieu et place de se laisser capturer, se suicidaient avec leurs enfants, par empoisonnement, sautant des remparts, des falaises, se tranchant la gorge, afin d'obtenir leur place parmi leurs divinités. Le sens de l'honneur de tes mercenaires est tout simplement admirable. Nuff respekt!